I am committed to moving us toward a Medicare for All system that guarantees affordable, high-quality care for every American. Medicare has proven to be the most cost-efficient way to deliver high-quality care. But we cannot simply wait for a Democratic president and Democratic majorities in Congress to pass a bill that will take years to implement. In the meantime, we need to take immediate action to stabilize our insurance market and build on the ACA in the short term and implement a Medicare public option immediately, as we work toward a universal system. The above tactic is not just useful to lawmakers, it also flatters them. Sure, you — pure, simple-minded M4A advocate (and hey, good for you for being so fired up! Love that energy!) — would love nothing more than to rain down free healthcare from the sky. But the real world is complicated. In the hyper-partisan political climate of 2019, with a Republican-controlled Senate and judiciary and Donald Trump in the White House, we can’t possibly expect a policy as divisive, costly, and transformative as Medicare for All to become law. (Healthcare) is an urgent issue for many families and we don’t have the luxury of time to wait years for a full overhaul of our healthcare system. That is why I was proud to join my colleagues in both the House and Senate to introduce the State Public Option Act...There are many ways we can achieve our shared goals of universal coverage, affordability and accessibility, and the State Public Option Act can help us get there. Here you see a concession to a fact so obvious even a pro-business New Democrat couldn’t ignore it: our nation’s healthcare system is broken. (“I agree, which is why I support [name of bill that isn’t Medicare For All. ]”) This has the added benefit of enabling politicians to defend their donors’ interests, while simultaneously insisting that the folks on opposite ends of the Medicare for All debate are actually arguing over strategic differences, rather than over who should and should not receive healthcare. They want the same thing you do...there’s just a difference of opinion on how we get there. Public option efforts like the one Rep. Schrier supports are undergirded by the same basic thesis: modest, incremental reforms are the optimal path to universal health coverage. We can’t have Medicare for All right now, but we can get it a step at a time. Note that it is never acknowledged how these steps would not immediately be recognized by Democrats’ political opponents for what they are. Nor is it acknowledged that each of these steps would represent a new opportunity for these opponents to undo the Democrats’ work, as we are currently seeing with the Affordable Care Act. The reason for this is simple: no one making these arguments is willing to go to bat for Medicare for All. These tactics are meant to grant corporate Democrats a patina of legitimacy and insulate them from criticism by their constituents. To understand just how disingenuous and ahistorical this case for pragmatism truly is, it’s helpful to look back at the Affordable Care Act’s passage, and its legacy just a decade later, in order illustrate how this careful, measured approach to healthcare reform plays out in Congress. It’s easy to forget that between the nation’s financial crisis, the Democratic takeover of both houses of Congress, and President Barack Obama’s landslide victory, by modern standards, over John McCain, no Democratic president had entered office with a greater mandate to enact his agenda in a generation than Obama in 2008—the same sort of political capital many Democrats now claim would be required to pass Medicare for All. 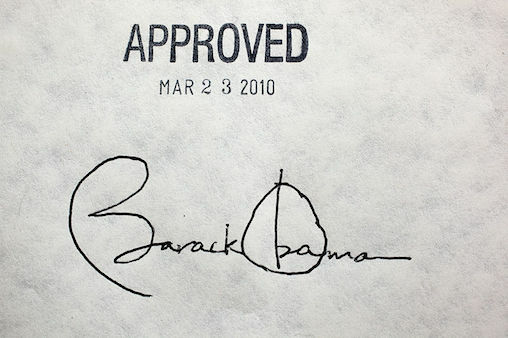 But Obama’s preternatural fixation on achieving bipartisan consensus relegated his signature legislation to a modest half-measure that left tens of millions uninsured, and millions more too broke to actually use the care they pay for. In the end, Democrats introduced over 150 amendments to the ACA in order to make it more palatable to Republicans. Not a single one of them ended up voting for the bill. Was the ACA too radical? Of course not. The bill’s origins can easily be traced to the right-wing Heritage Foundation, who first made the pitch for an ACA-like plan in the 1990s. Then-Massachusetts Gov. Mitt Romney passed a state-wide iteration of this plan in 2006. The reason ACA didn’t pass with a single Republican vote in 2010 was because it was the Democrats’ health care bill, and any Republicans who did support it would’ve been primaried into oblivion. So what hope does a public option bill, or even Pelosi’s modest “Protecting Pre-Existing Conditions and Making Health Care More Affordable Act,” have at achieving bipartisan support? Is there a single person on the planet who would argue that Congress has become less polarized in the last decade? Any Democrat would be hard-pressed to deliver a convincing answer. We ought to recognize these contemporary appeals to pragmatism and moderation for what they are: naked attempts by corporate Democrats to keep donors placated and beat back a resurgent left, while casting themselves as progressive champions. It is precisely this strategy that has led not only to flawed healthcare policy in the form of ACA, but bills like Pelosi’s, which attempts to solve problems with the ACA that the Trump administration has been able to exploit through court challenges and executive orders, thanks in large part to its patchwork nature. When we play the proverbial tape all the way through, we can clearly see that the public option and its ilk are not pragmatic alternatives, or “one path” of many, to achieving universal health coverage. But this leaves socialists with a legitimate question to answer: if a public option is a non-starter in today’s hyper-partisan Congress, then what hope is there of passing a truly transformative healthcare bill that brings us Medicare for All, like H.R. 1384? We ought not be made to feel defensive about this question. The answer is one DSA organizers are uniquely equipped to give, and ought to do so whenever possible, as it further illustrates our analytical departure from our opponents on the right. Unlike most liberals, socialists accurately recognize that what plays out in the halls of institutions like Congress doesn’t happen in a vacuum. “Not having enough votes” to enact this or that piece of legislation is not a conversation-ender for us. If it were, then Medicare for All, which was barely discussed outside of niche policy circles as recently as 2014, wouldn’t be one of the most popular political demands among working people in America, and H.R. 1384 wouldn’t have over 100 cosponsors in the House. No DSA member should be content to let this debate play out in Congress alone. If we leave it to the politicians to decide, they, and their deep-pocketed donors, will win every time. Instead, DSA’s Medicare for All campaign allows door-to-door organizers to connect with workers in strategic sectors around the basis of a shared material interest, particularly unionized nurses and teachers, who are uniquely qualified to agitate for this demand—holding the institutions to which they belong, and by proxy, the politicians they support, to account. Through our canvassing efforts, we speak with voters who aren’t in any politician’s databases: folks who are so thoroughly disillusioned by the political system that politicians have literally given up on trying to reach them. Liberal voters are clearly quite receptive to wafer-thin, ahistorical arguments over what is and is not “achievable” legislation. They may have the candidates, the money, and (at least for now) the institutional legitimacy, but they don’t have any answers. If DSA is to combat corporate Democrats’ appeals to their voters’ sense of despair over healthcare, we can’t do it on our hind legs. We have something to offer that they don’t: the promise of a better future. Paul Alexander is the Northwest Regional Organizer for DSA Medicare for All.